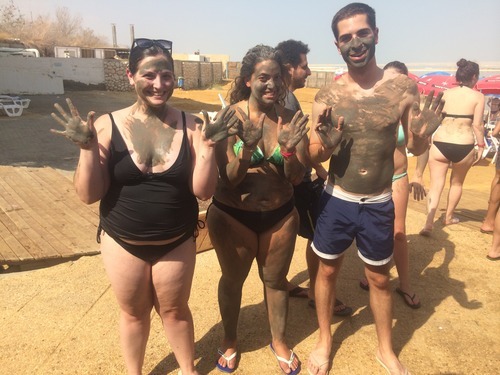 As you may be able to tell by the title of this post (and if you read yesterday’s post), today I went to Ein Gedi and Yam HaMelach, the Dead Sea. However, the word “Yam” in Hebrew means “sea” and the word “HaMelach” means “the salty.” So literally, Yam HaMelach translates into The Salty Sea. And THAT is the reason of the title of my post. Okay, I’m babbling now. The bus came to pick us up at 7:35, so it was a very early morning. We arrived at Ein Gedi sometime around 11:30-ish. 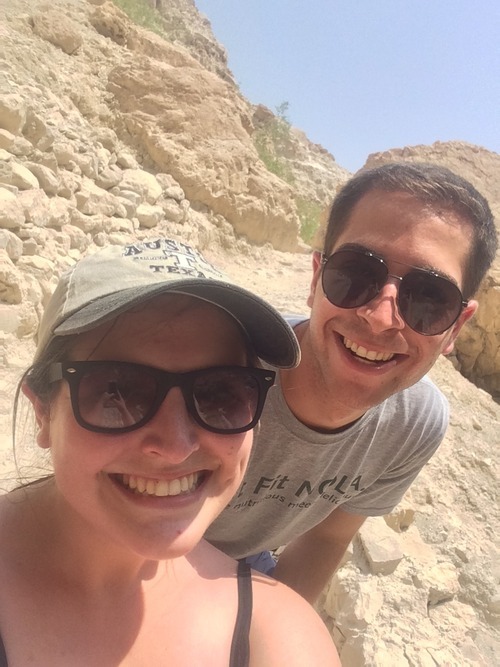 I honestly have no idea why it took us so long and why we made so many stops, as Ein Gedi is a hiking path and it gets very, very hot. But either way, it was beautiful, to say the least! We walked through a very desert-y area, and then came across a gorgeous oasis! We then proceeded to get disconnected from the group. Yes, we got lost because we stopped to take a selfie. So sue us. Luckily a few more people from the group came and joined us and they knew the way to go. We were saved. It was a steep hike up some rocky and crooked stairs, but we finally made it to the waterfall: so worth it. I’m just going to show the pictures and let you see for yourself. Obviously it’s much more gorgeous in person, but I think you’ll get the general idea. I’m not burned, it was just really hot outside; I had on like 4 layers of sunscreen, I promise! 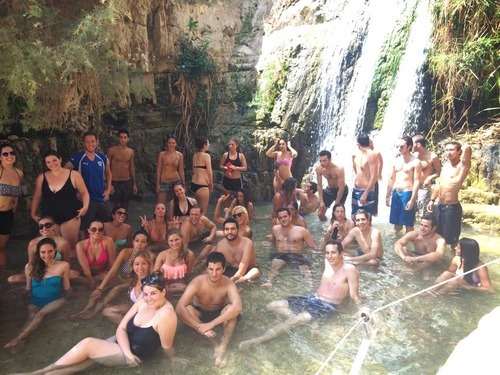 We hiked back down to the entrance of Ein Gedi and hopped on the bus to actually go to the Dead Sea. Finally. We arrived at 1:30, nearly 6 hours after we left Tel Aviv. Now, I was a bit nervous to enter the water, as I had a few cuts on my body that I knew were going to sting. But I was still determined to get in, at least for a little bit. The bus stopped and we were greeted with this lovely sign to come on in. Oh, Israel… So the majority of the participants went straight to eat lunch. I had packed a lunch (yay me!) and was ready to dive right in to the water. Metaphorically of course. Had I done that literally, that probably would have been the stupidest thing I’d ever done in my life. Rocks made entirely out of salt lined the water. I took one step in, wearing my flip flops, and my foot sank. The water was incredibly hot and I ended up losing a shoe. This happened a few more times, each instance had me scrambling for my shoes and wanting to just escape the flaming salt. Once I actually got past the salt of doom, and into the water, it was amazing. The water’s oils soothed my skin (hardly any burning cuts!) and made it feel unbelievably soft. I just wanted to cover my entire body so it would always feel this amazing. 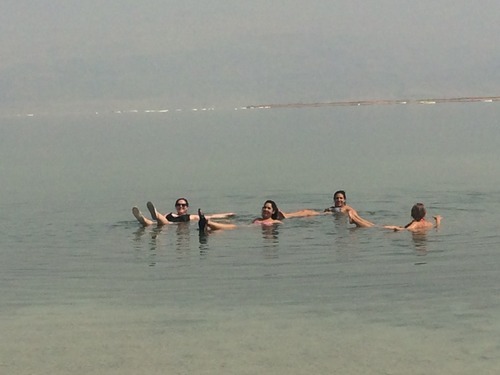 As I’m sure you know, the Dead Sea is known for being able to make you float very easily. I sat back and lay down on top of the water. It was like magic. We stayed in the water for a good 15 minutes before things started to burn. Not going to provide too many details. Just know I was in pain and needed to get out. I got out as quickly as I could, which was really not very fast at all, and showered off with fresh water. My skin still felt wonderful. About 20 minutes later, I went back in with the rest of the group who had finished eating. I lasted even less time though. Oh well. I came back to shore a second time and the tour guide had bought us mud from the store (as this beach did not have mud). 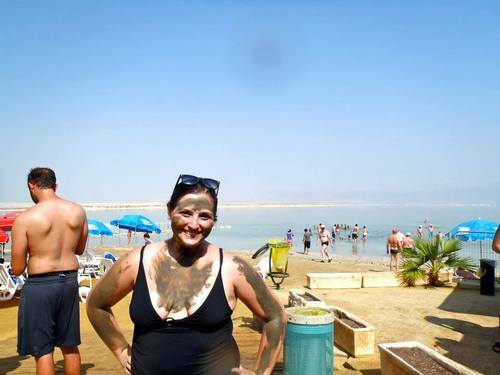 When at the Dead Sea, cover yourself in mud, and that is exactly what I did. With the mud, you need to wait for it to harden, and then you can rinse it off. Smiling for this picture felt so strange, as it was difficult to move. After 10 minutes, my mud had hardened and I went to rinse it off. Even as I write this post the next day after having showered and slept, my skin still feels wonderful. 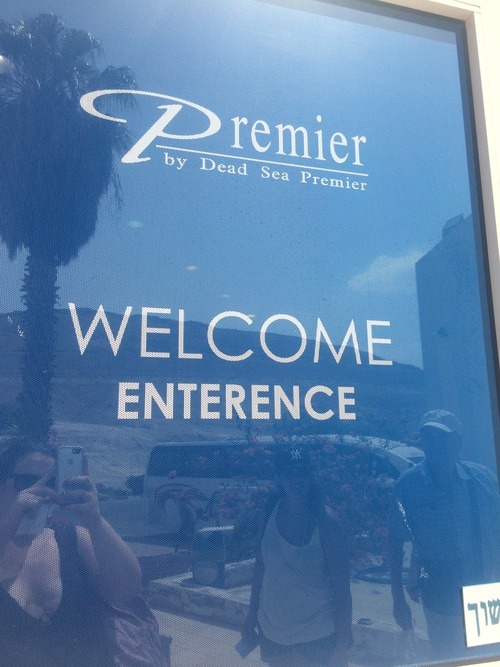 The Dead Sea really does have magical powers. We got on the bus to go home at around 3:30, expecting to arrive home by 5:30. I didn’t actually walk through my front door until almost 7pm because of the traffic through Jersualem. It was insane. I hopped into the shower and then proceeded to cook myself some dinner. As I was in the process though, our friend Daniel (a different Daniel than in today’s pictures; sorry for the confusion) came over with ingredients to make homemade schnitzel. How could we possibly turn it down? It was great! But how can you really mess up breaded and pan-fried chicken? After dinner, we all got ready to go to our friend Jake’s house for a get-together. Jake chose not to get housing through Masa, as he is planning on making aliyah (which means moving to Israel). We had a great time getting to know some of his friends and roommates as well as people from the program. At a very late hour, my roommates and I decided to go home. I got in a cab with 2 other people, my neighbor Sarah and our friend Adam, and we drove to Adam’s house. I for some strange reason thought we were getting ripped off by the cab driver, so all 3 of us proceeded to exit the cab and Sarah and I walked home. We ended up getting some free French fries (they call them chips here, just like in the UK) and enjoyed our 10-minute walk home. I then proceeded to completely pass out from a day of exhaustion and nearly 24 hours spent awake. It’s almost Shabbat, and I feel I definitely deserve some rest after the week and a half of activities I’ve had since I’ve been in Israel. Everything has been amazing, of course, but I’ve definitely been getting a bit burnt out from all of fun and adventure I’ve been having. I think I will be trying a reform synagogue tonight for Kabbalat Shabbat, so I will let you know how that goes! Have a great weekend, everybody. I know I’m planning on it!